THAT NECKLINE!!! My analytical mind wanted to know for sure what it was about the pattern that was different. I decided to do some measurements and find out exactly what the difference is in the neckline that causes it to sit on my chest so well. I took my measuring tape and measured the pattern at the neck seam to determine the percentage difference from the band. I found that it is a 12.25% ratio of neckline-to-neckband. Plus the band is cut on an angle at the closure, which to me creates a snugger fit for the band. I used that same percentage when I drew my new opening for this top, a little change from the basic "renfrew" which is much more open, to this more modest version and used the ratio I came up with as the base for determining my band length. 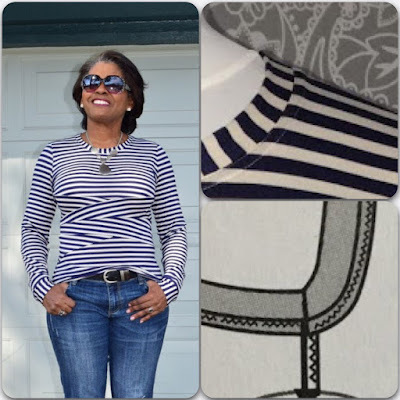 I got the idea of this top from my regular StitchFix box this last week. (More on that later.) As soon as I saw this top out of the box, I remembered this fabric and knew it was going to be mine. Now I know this lady, Susanne C., my stylist, is in my head, or following my Periscopes or my instagram or something. I suspect this, because she sent me exactly the things I had been talking about on my YouTube channel or other social media. SMH...this internet is really "mmmmmm....I can't say." 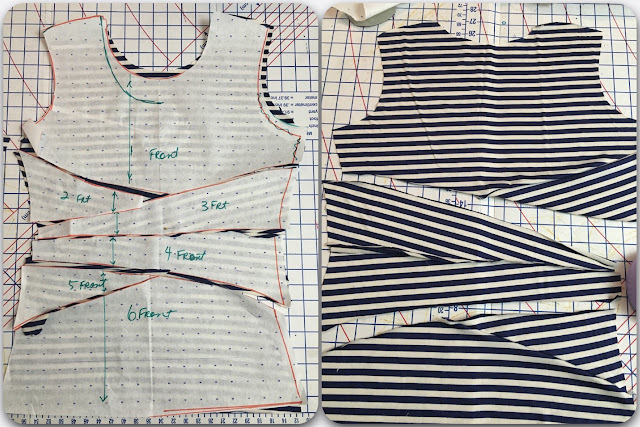 Of course you know me, duplicate the heck out of that top.....I copied the front section of the original and then transferred the details to the back of the renfrew and used the neckline of their top, but made the ratio of neck to band based off the refrew to ensure the fit was spot on. 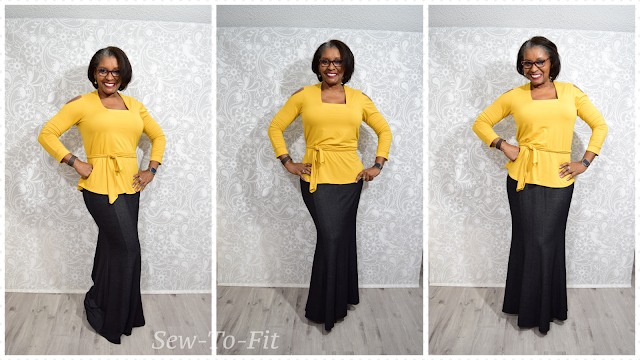 The sleeves are my renfrew sleeves as well as all the upper body, notwithstanding the neckline...as I said, I made that smaller to match the StitchFix version. See the video here for more details on that shipment. I enjoyed making this top, and the fact that it was chosen by a stranger....is even more unsettling. Wow. Check out those boyfriend jeans. I have never even tried on a pair of those at the store. I just don't like shopping too much y'all. So when I do go shopping I stick to what I know, which is not very good. Its just a limitation I have. Now I understand why there are stylist and wardrobe planners out there to help. Take care and stay tuned for more to come....I'm always working to bring you fun things to look at, consider and talk about. Please subscribe via email at the top for faster updates when I post. 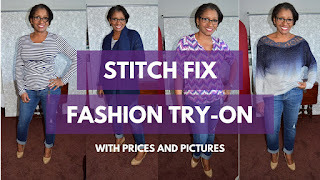 Next up....."Stitch Fix Video." Thanks Stephanie....it has become my base knit base. Thanks Sharon. I love Alicia keys. Nice work, Andrea. Love stripes! Looks good on you. Oh this top is so chic and stylish on you - beautiful! Thanks Tamosa. That stitch fix is working out pretty well. 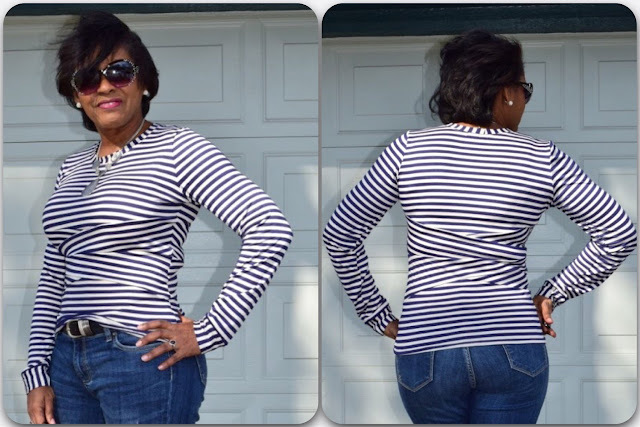 Oh Ms. Andrea, you did an awesome job duplicating the RTW top! I like yours better! You look so super stylish in the total outfit! 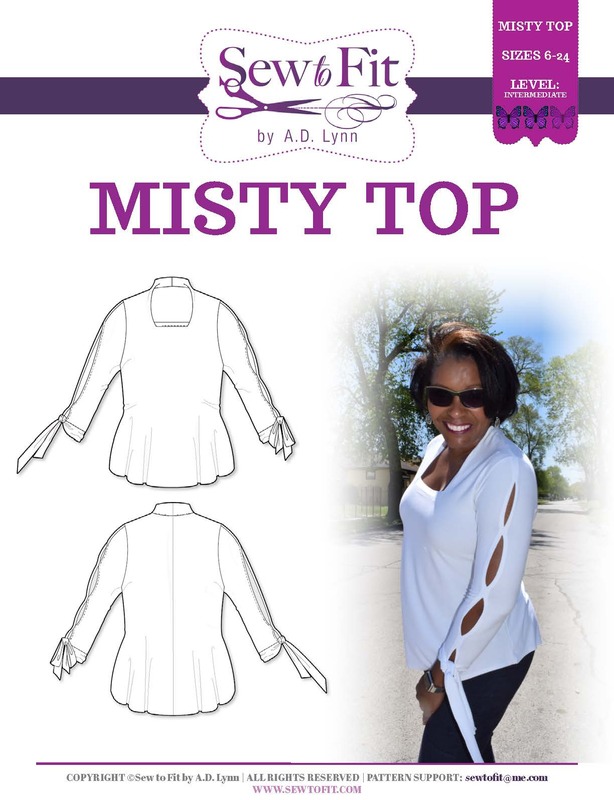 I viewed the Periscope to see how you created this top, but I guess you never got to that part. Are you going to plan another Periscope demonstration of this top for those of us still interested? Thanks Myra....yes, I do plan to make a tutorial for this top. I didn't get to it on my scope. Very cute; I have also wondered about the appeal of the Renfrew top. Yours is so cute I may have to try it. Any more details about a FBA on it? ohhhhh I so love this! Love, love, love the top. You did a fab job copying the original. I would love a video of the whole process you went through to copy it using the Renfrew. And those jeans are made for you. You look just fantastic. Thanks for sharing. Thanks Andsewforth...I'm working on the tutorial. Caught the replay on the sleeve application - VERY INTERESTING and I learned a lot. Hope I can remember it all. Love the way you matched the stripe of the bodice and sleeve cape, I often have a problem with that. Your neckband is on fleek too. I've had the Renfew in my pattern stash of eons, maybe now I'll be inspired to do something with it. Thank you Faye....I'm glad it helped with the sleeve. 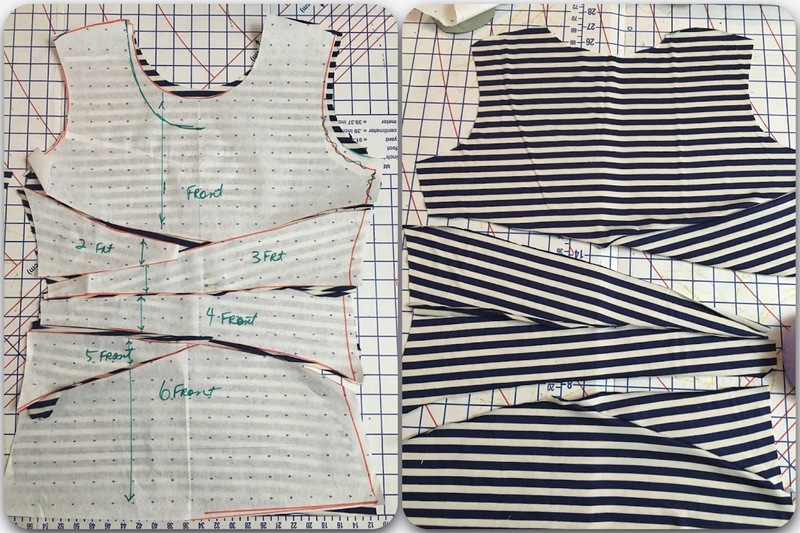 You should go ahead and pullout that Renfrew...once you get that fit correct, it really is a help having all the different necklines readily available for any top you choose anytime. I love when you hack a pattern because you always end up with something that is absolutely stunning. This top proves my point! It is just awesome!!! Thanks Carolyn...I did get into a little of a rut for a while there. Now all I want to do is tryout new styles with my base patterns. So many ideas, and I'm tired of searching for patterns, says the pattern geek. LOL. You look awesome. That top looks exactly like the stitch fix version. You rocked it! Thanks Natisha C. I appreciate it...it was fun making. I have ideas for so many other versions. Andrea you are a talented master fitter! I absolutely love the T-shirt pattern you used, and can't wait until I get mine done. I've so many projects in line that I feel so overwhelmed. Thank you Janet. I really appreciate the confidence you have in me and what I have to offer the sewing community. Try to just focus on one item at a time. Andrea, this is indeed a beautiful T-shirt. Glad I got to see it Monday night! And thanks so much for sharing your pant-fitting genius with us at the Fashionista meeting. I was thrilled to be one of the fitting examples!! Very fortuitous as I've been trying to wrap my head around pants-making this past year. I'll be making pants very soon, thanks to you! Cathy, it was a joy working with you, and I really appreciate you traveling so far to join the program. I look forward to seeing your pants. Thanks Hope, a nursing top is hard in itself...you shouldn;t have a problem doing this one. You are more than welcome Leona....thank you for the support. 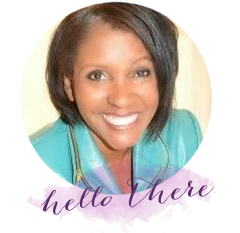 Oh, well hello there LaShonda...yes, to share on pinterest just hover over a photo and you should see the pin button the face of the picture. Click on that and it will do the rest, if you are on your mobile device I wouldn't really know. HELLO this shirt is HOOOOTTTT!!!!!!!!!!!!!!!!!!!!! You are smoking in this outfit!!!! I want to make a shirt like this! I love it! PERFECTION!! Well thank you very much Ruqayyah!! 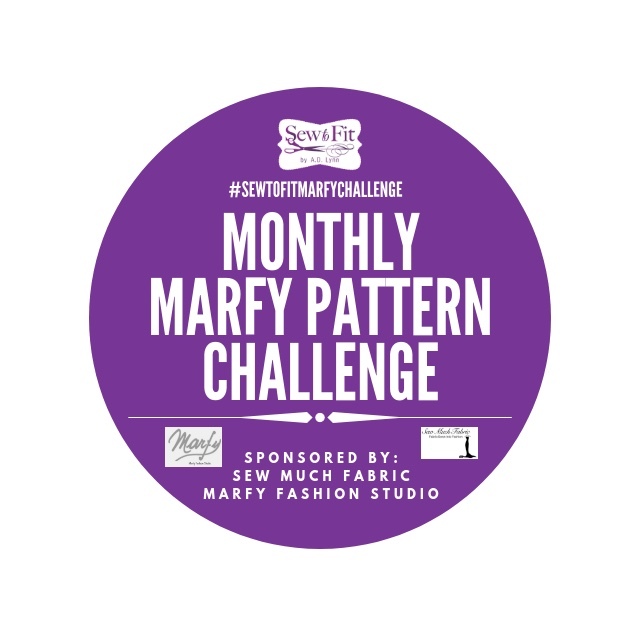 #sewtofit the fit is awesome, going to have to try this one! Thank you Karel... go for it lady. Wow awesome top and the whole outfit looks amazing on you! !